Context: It has been proposed that oral squamous cell carcinoma (OSCC) arising in preexisting oral submucous fibrosis (OSMF) constitutes a clinicopathologically distinct disease than the OSCC arising without OSMF. Expression of myofibroblasts is an early event in tumorogenesis, and its expression in malignant lesions has been suggested to represent an important participant in invasion. Aim: To evaluate the expression of myofibroblasts in OSCC arising in OSMF and OSCC without OSMF. Settings and Design: Thirty each histopathologically proven cases of OSMF, OSCC with OSMF, and OSCC without OSMF were included in the study. 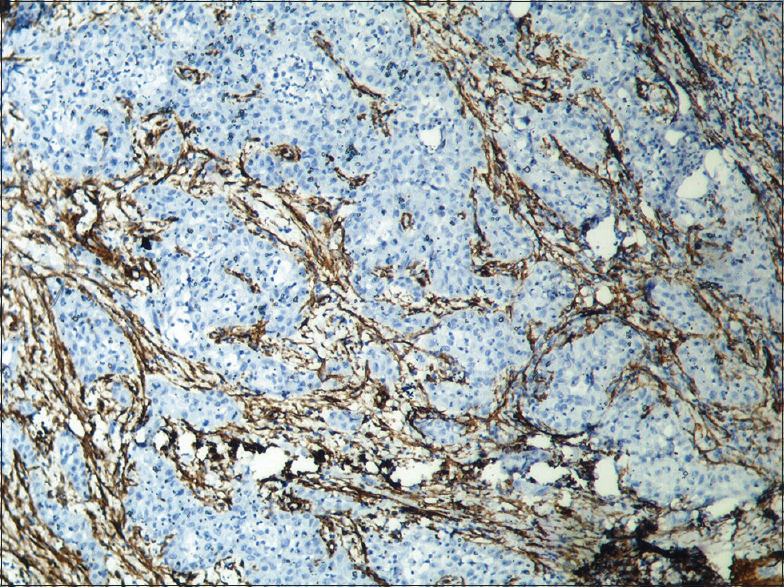 The tissue sections were studied for histopathological evaluation and alpha-smooth muscle actin (α-SMA) expression. Statistical Analysis Used: Descriptive and inferential statistics using Kruskal–Wallis test, Mann–Whitney test, and Chi-square test. Results: The expression of α-SMA was found to be high in OSCC with OSMF and OSCC without OSMF group as compared to OSMF group. However, the difference between α-SMA expression in OSCC with OSMF and OSCC without OSMF group was found statistically nonsignificant. 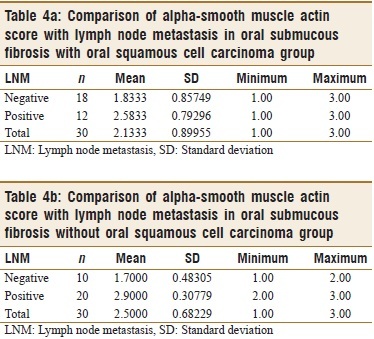 Comparison of α-SMA score with histopathological grading and tumor, node, metastasis staging in OSCC with OSMF and OSCC without OSMF groups showed statistically nonsignificant difference, whereas comparison of α-SMA score with lymph node metastasis was statistically significant. Conclusion: The altered extracellular matrix in OSCC with OSMF could be responsible for modified epithelial–mesenchymal transition, which is further proven by reduced intensity and distinct pattern of α-SMA staining in OSCC with OSMF. Most invasive oral carcinomas are preceded by clinical premalignant lesions and conditions such as oral leukoplakia, erythroplakia, oral lichen planus, and oral submucous fibrosis (OSMF). These remain in preinvasive stage for years and the cancerous alterations remain indolent and not readily recognizable on clinical and histopathologic examination. Among these, OSMF is a chronic progressive, debilitating disease affecting oral, oropharyngeal, and sometimes the esophageal mucosa. It is characterized by changes in the connective tissue fibers of the lamina propria and submucosa leading to stiffness of the mucosa and restricted mouth opening. It predominantly affects people of Southeast Asia and Indian subcontinent, where chewing of areca nut and its commercial preparation is high. Epidemiological and in vitro experimental studies have shown that pathogenesis of OSMF is directly related to arecoline present in areca nut and most of the alterations in various pathways and molecules leading to accumulation of collagen are mediated through it. Malignant transformation of OSMF has also been studied by various researchers. The role of areca nut as a carcinogen is proven beyond doubt with a large number of animal studies demonstrating its carcinogenicity, mutagenicity, and genotoxicity. It has been classified as a “group 1 carcinogen” based on epidemiologic and laboratory studies as per the second IARC monograph on betel quid. The malignant potential of OSMF was first recognized in 1956 by Paymaster and the rate of malignant transformation is estimated to be 7%–13% in recent years. Recently, it has been proposed that oral squamous cell carcinoma (OSCC) arising in preexisting OSMF constitutes a clinicopathologically distinct disease from the OSCC arising without OSMF. This distinction is attributed to the distinct mechanism of areca nut carcinogenesis as compared to tobacco. It has been recognized that most of the patients of oral cancer with OSMF are younger males with better prognostic factors such as better grade of tumor differentiation, lesser incidence of nodal metastases, and extracapsular spread., This raises the question, whether extracellular matrix (ECM) in OSMF is different and resistant to normal invasive mechanisms? Does this contribute to the better prognosis in OSCC arising in preexisting OSMF? Endothelial cells, pericytes, inflammatory cells, fibroblasts, and ECM constitute the tumor milieu or tumor microenvironment which contributes to tumor growth, invasion, and metastasis. The role of tumor stroma and epithelial–mesenchymal transition (EMT) in tumor progression is an important area of current research and has become a potential target for therapeutic intervention. In OSCC, the tumor tissue is surrounded by reactive stroma, made up mostly of cancer-associated fibroblasts, also known as myofibroblasts. Transdifferentiation of fibroblasts to myofibroblasts is a crucial and early event in tumorigenesis, which is mediated by growth factors and cytokines expressed by tumor cells. Myofibroblasts secrete numerous growth factors and inflammatory mediators that stimulate epithelial cell proliferation. Considering that genetic and epigenetic factors are capable of affecting both epithelium and lamina propria, it can be assumed that carcinogenesis and tumor progression result from a defective response of both compartments. Myofibroblasts, i.e., activated fibroblasts expressing α-smooth muscle actin, which produce collagen and extracellular matrix proteins, constitute the “desmoplastic reaction” and have been suggested to represent an important player in the development of the invasion process. Its expression in aggressive and malignant lesions has been suggested to represent an important participant in invasion. We hypothesized that the EMT in OSCC arising in OSMF is distinct from EMT occurring in OSCC without OSMF due to the distinct and altered ECM already present in OSMF. This may change the behavior of invading epithelium and may contribute to altered aggression and thereby constituting a distinct subentity of OSCC arising in OSMF. The study was approved by the institutional ethics committee. The study included 30 each formalin-fixed, paraffin-embedded tissue blocks of histopathologically proven cases of OSMF, OSCC with OSMF, and OSCC without OSMF, from the archives of department. Twenty tissue blocks of normal oral mucosa (NOM) obtained from gingival and vestibular mucosa after extraction of impacted teeth were used as controls. The sections were cut serially to 5 μm thickness for immunohistochemistry to evaluate the expression of alpha-smooth muscle actin (α-SMA) antigen. The immunohistochemistry for the detection of α-SMA antigen was performed using Universal Immuno-enzyme Polymer method. The tissue sections were deparaffinized with xylene and hydrated through descending grades of alcohol. Antigen retrieval for α-SMA was carried out by heating tissue sections in microwave oven for 10 min in 0.01 M sodium citrate buffer (pH 6.0) and bench cooled for 20 min, and again the same cycle was repeated once. After rinsing in PBS, the sections were incubated with 3% H2O2 in methanol for 30 min to block the endogenous peroxidase activity. The sections were then washed three times with gentle shaking in PBS for 5 min each. To prevent nonspecific reactions, sections were incubated with 10% serum for 10 min. The sections were then incubated with α-SMA antibody (ready to use, prediluted, monoclonal mouse anti-human α-SMA, clone: 1A4; product code: IR611, Dako, Denmark) at room temperature in a humidifying chamber for 90 min. 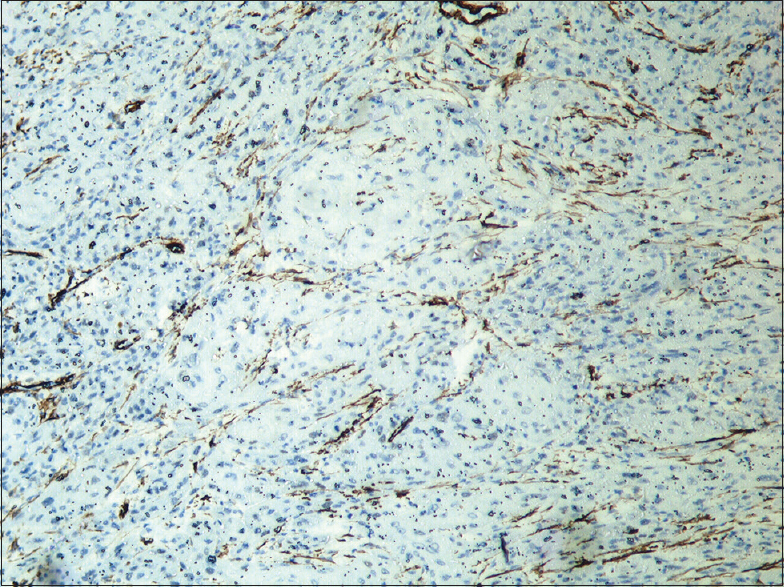 Pyogenic granuloma showing α-SMA expression was used as a positive control. One section from each positive control was used as the negative control by omitting the primary antibody and by incubating with serum. After the primary antibody and antigen reaction, the sections were rinsed in PBS three times for 10 min each. The HRP-labeled polymer antimouse (Dako EnVision + System HRP-labeled polymer antimouse, product code: K4000, Dako North America Inc.,) was incubated at room temperature in humidifying chamber for 30 min. After the PBS washing three times for 10 min each, freshly prepared substrate/chromogen solution of 3, 3' diaminobenzidine (DAB) in provided buffer (mixing 5 μl of concentrated DAB in 50 ml of substrate buffer) was used to visualize the antigen-antibody reaction. Finally, the sections were counterstained in Mayer's hematoxylin. Two oral pathologists evaluated immunohistochemically stained tissue sections independently in double-blinded manner. Differences in interpretation were resolved by consensus review with a third oral pathologist. Blood vessels present within the connective tissue of the immunostained sections served as a positive internal control, especially in cases of NOM. These internal controls confirmed that antigenic expression was correctly maintained in the study sample. Stromal cells (other than noninflammatory and nonendothelial) positive for α-SMA were regarded as myofibroblasts, showing intracytoplasmic brown staining irrespective of the intensity of staining. Immunostaining was assessed by the evaluation of percentage of α-SMA-positive cells, according to the method proposed by Tuxhorn et al. and applied by Etemad-Moghadam et al. The percentage of immunopositive cells seen among the noninflammatory and nonendothelial stromal cells present in the subepithelial connective tissues of OSMF was recorded. In OSCC with OSMF and OSCC without OSMF groups, the immune-positive cells which were between and around the neoplastic islands were recorded. The percentage of cells positive for α-SMA in the tumor stroma was recorded as: 0 = no positive cells, 1 = 1%–33% positive cells, 2 = 34%–66% positive cells, and 3 = 67%–100% positive cells by the two observers. Scores 1, 2, and 3 were graded as mild, moderate, and intense expression of α-SMA, respectively. According to Vered et al., the distribution pattern of myofibroblasts, the arrangement of positive-stained cells, was classified into 3 groups: focal – if myofibroblasts had a focal arrangement or had no special arrangement in different areas of connective tissue stroma; network – myofibroblasts with vesicular nuclei and abundant cytoplasm arranged in multiple rows with interwoven network of cytoplasmic extensions forming a network in the stroma of the connective tissue; and spindle – myofibroblasts arranged in one to three concentric layers in a regular order tightly adhering to the periphery of the neoplastic islands. Differences in α-SMA immunoreactivity between and within study groups were done using descriptive and inferential statistics using Kruskal–Wallis test, Mann–Whitney test, and Chi-square test. Statistical significance was set at P < 0.05. All statistical analyses were performed using SPSS 17.0 version (SPSS Inc., IL, Chicago). The present study consisted of 30 each histopathologically proven cases of OSMF, OSCC with OSMF, and OSCC without OSMF and 20 cases of NOM. As per the WHO grading system of head and neck OSCC, OSCC with OSMF and OSCC without OSMF cases were grouped into well differentiated OSCC (WDOSCC) (n = 12 and n = 10 respectively) and moderately differentiated OSCC (MDOSCC) (n = 18 and n = 20, respectively). There were no cases of poorly differentiated squamous cell carcinoma. As per clinical tumor, node, metastasis (TNM) staging, in OSCC with OSMF group, there were 14 cases of stage II and III each, whereas 2 cases were of stage IV. In OSCC without OSMF group, there were 9 cases of stage II, 13 cases of stage III whereas 8 cases were of stage IV. Less number of cases (40%) showed lymph node metastasis (LNM) in OSCC with OSMF group as compared to OSCC without OSMF group (66.66%). The blood vessels present within the connective tissue of the immunostained sections were served as positive internal control. The OSMF, OSCC with OSMF, and OSCC without OSMF group's tissue samples demonstrated α-SMA expression with varied intensity. No tissue samples of NOM showed α-SMA expression [Figure 1]. A statistically significant difference was observed in α-SMA expression among all the groups (Kruskal–Wallis test; P = 0.000). Using Mann–Whitney test, the expression of α-SMA was found to be high in OSCC with OSMF and OSCC without OSMF group as compared to OSMF group (P = 0.000). However, the difference between α-SMA expression in OSCC with OSMF and OSCC without OSMF group was found statistically nonsignificant (P = 0.778). 20% cases showed mild and only 6.7% cases showed moderate α-SMA expression in OSMF group, which on histopathological evaluation showed mild epithelial dysplasia [Table 1]. On evaluation of the distribution pattern of myofibroblasts, α-SMA expression was observed mostly between and around the neoplastic islands in OSCC. The predominant pattern observed was network and spindle whereas focal pattern was less frequent in OSCC with OSMF and OSCC without OSMF group [Figure 2], [Figure 3], [Figure 4]. Very few cases (26.67%) of OSMF group showed focal pattern of α-SMA expression. The distribution of myofibroblasts was not significantly different between the histopathological grades of OSCC in OSCC with OSMF and OSCC without OSMF group. 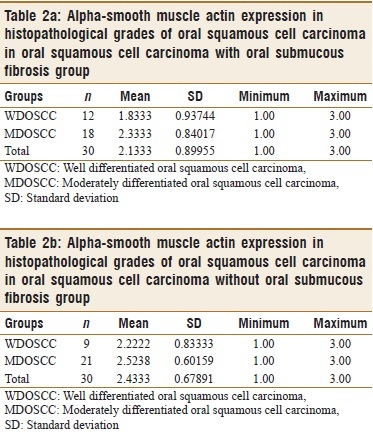 Comparison of α-SMA score with histopathological grading of OSCC (WDOSCC and MDOSCC) in OSCC with OSMF and OSCC without OSMF groups showed statistically nonsignificant difference (Chi-square test, P = 0.143 and P = 0.349, respectively) [Table 2]a and [Table 2]b. The α-SMA score was higher in clinical TNM stage IV as compared to stage III and II in OSCC with OSMF group, whereas no difference in α-SMA score in stage II, III, and IV was observed in OSCC without OSMF group. 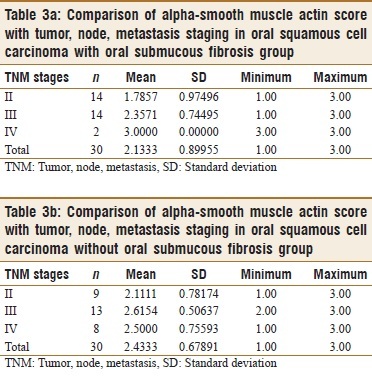 On comparison of α-SMA score with TNM staging in OSCC with OSMF and OSCC without OSMF groups, it was found statistically nonsignificant (Chi-square test, P = 0.103 and P = 0.110, respectively) [Table 3]a and [Table 3]b. On comparison of α-SMA score with LNM in OSCC with OSMF and OSCC without OSMF groups, it was found statistically significant (Chi-square test, P = 0.02 and P = 0.000, respectively) [Table 4]a and [Table 4]b. The mechanism of malignant transformation of OSMF has been studied by various researchers. It is hypothesized that the dense fibrosis, epithelial atrophy and less vascularity, in the presence of an altered cytokine activity creates an unique environment for carcinogens from areca nut to act on the epithelium. It could be assumed that the carcinogens accumulate over a long period of time either on or immediately below the epithelium allowing the carcinogens to act for a longer duration before it diffuses into submucosal tissues. Less vascularity may deny the quick absorption of carcinogens into the systemic circulation. Apart from this, the most controversial issue to deal is, how an epithelial malignancy develops in a predominantly connective tissue disorder? Recent evidence indicates that the cancer development and progression are facilitated by epithelial–mesenchymal interactions and transition. There are altered keratinocyte phenotypes which predispose to development of malignancy in OSMF as a result of epithelial–mesenchymal interactions. Another thought is that the primary changes are in ECM which further induces modifications in the epithelium in case of OSCC arising in OSMF. In OSCC without OSMF, there is transition of NOM to epithelial dysplasia ultimately leading to OSCC. Thus, the primary changes are in the epithelium, followed by changes in ECM. On the premise that the type of ECM is different in OSCC arising from OSMF, we hypothesized that the mode of expression of α-SMA, i.e., myofibroblast, would be different in case of OSCC with OSMF. In this study, α-SMA expression was observed in all the tissue samples of OSCC with OSMF and OSCC without OSMF groups in varied intensity (mild, moderate, and severe). Our study results were in accordance with Kellerman et al., who in a correspondence article reported the prognostic significance of myofibroblasts in squamous cell carcinoma of the tongue. Etemad-Moghadam et al., Vered et al., Seifi et al., Chaudhary et al., and Rao et al. also observed significantly higher myofibroblasts in OSCC compared to normal and dysplastic epithelium and explained the role of α-SMA-positive myofibroblasts in invasive behavior of OSCC. The most evident phenomenon of stromal activation in OSCC is the presence of myofibroblasts, which can be considered as the result of EMT. This transdifferentiation of myofibroblasts is induced by a variety of cytokines and growth factors, such as TGFß1, TGF-α, and IGF-related factors from cancer cells.,, Myofibroblasts express proteases, including urokinase plasminogen activator, fibroblast activation protein, and MMPs. Production of these components results in ECM remodeling that could stimulate cancer cell growth and migration. Moreover, myofibroblasts have been reported to secrete growth factors that promote angiogenesis. Therefore, myofibroblasts appear to be a key cell type involved in creation of the tumor-promoting reactive stroma environment, which is evidenced by the expression of α-SMA in OSCC with OSMF and OSCC without OSMF groups in this study. 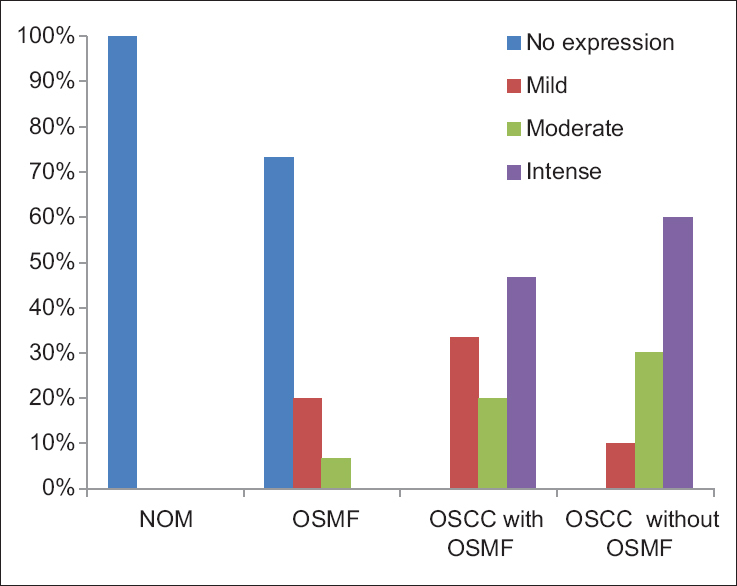 Further on comparison of α-SMA expression among OSCC with OSMF and OSCC without OSMF groups, there was a marked difference in % of positive cells. In OSCC with OSMF group, more number of cases (33.30%) showed mild expression of α-SMA, as compared to OSCC without OSMF group (10%). Myofibroblasts differentiation is one of the key events of EMT which further modify the ECM and eventually progression to malignant transformation occurs. In case of OSCC arising from OSMF, there is EMT at two levels: one when there is excessive collagen cross-linking in the ECM as a result of cell injury caused by areca nut extract which triggers various pathways and the other when there is malignant transformation. In OSCC arising from OSMF, transdifferentiation of myofibroblasts can be considered as a result of remodeling of ECM as well as second level of EMT. It is very logical to speculate that in case of OSCC arising from OSMF, there is mechanical stiffness of the stromal tissue, which also imparts transport resistance and acts like a scaffold. Apart from this, a close contact is needed for OSCC cells for induction of myofibroblasts transdifferentiation. In OSCC arising from OSMF, there is pronounced fibrotic response, termed desmoplasia which may be a factor which inhibits required contact necessary for myofibroblasts differentiation. The predominant pattern of stromal α-SMA expression that is myofibroblasts distribution observed was network and spindle, whereas focal pattern was less frequent, in OSCC with OSMF and OSCC without OSMF groups. In OSMF group, very few cases showed focal pattern of α-SMA expression. Our results were in agreement with Vered et al., Seifi et al., and Chaudhary et al., who stressed on the fact that there seems to be a relationship between cell distribution pattern and tumor invasive behavior. Higher the number of myofibroblasts in network pattern, more invasive the tumor phenotype as compared to spindle and focal pattern. Myofibroblasts are thought to accelerate the progression of malignant epithelial cells because of increased cancer cell proliferation, decreasing cancer cell death, and activated proteolysis. Apart from this, the MMPs secreted by myofibroblasts have a role in destruction of ECM, tumor formation, migration, invasion, metastasis, angiogenesis, and induction of apoptotic clones. In this study, the presence of myofibroblasts was observed in all the histological grades of OSCC in OSCC with OSMF and OSCC without OSMF groups. No significant difference was seen between the three histological grades of OSCC. This was in agreement with the results obtained by Kellermann et al. and Etemad-Moghadam et al. who were also unable to find a correlation between OSCC differentiation and the presence of myofibroblasts. However, our study results were not in agreement with Chaudhary et al. who observed significantly higher α-SMA expression in MDOSCC as compared to WDOSCC. In OSCC with OSMF group, no statistically significant difference was observed in α-SMA score between TNM stage II and III; however, increased expression of α-SMA was seen in TNM stage III. As there were only two cases of TNM stage IV, it could not be included in statistics. No difference in α-SMA score in stage II, III, and IV was observed in OSCC without OSMF group. On comparison of α-SMA score with TNM staging in OSCC with OSMF and OSCC without OSMF groups, no significant difference between clinical stage of the OSCC and α-SMA expression was observed. This supports the view that as the TNM stage progresses from stage I to IV, the α-SMA expression also increases. These findings may suggest that the transdifferentiation of myofibroblasts is induced somewhere in the invasive stage of SCC, and further loss of tumoral differentiation (increased grade) and increasing clinical TNM stage are unrelated parameters. On evaluation of data in relation to pathologically confirmed LNM, it was observed that less number of cases (40%) show LNM in OSCC with OSMF group, as compared to OSCC without OSMF group (66.66%). Further on comparison of α-SMA score with LNM in OSCC with OSMF and OSCC without OSMF groups, it was found statistically significant. It is an established fact that the elevated myofibroblast is a predictor of prognosis of OSCC patients. Since cervical metastasis is one of the major prognostic factors in patients with OSCC, this could be a contributing factor. Patients with lymph node metastases show significantly lower survival rates than those with disease-free nodes. However, we could not find any association between myofibroblasts expression and patient's survival. In this study, in OSCC with OSMF group, more number of cases (33.30%) showed mild expression of α-SMA, as compared to OSCC without OSMF group (10%). Probably, this lower expression of α-SMA is indicative of a less aggressive phenotype which is also reflected by LNM. Clinical experience indicates that OSCC with OSMF has better prognosis. This study is an attempt at drawing conclusion regarding cause of better prognosis. The answer could lie in the altered stroma in OSMF. The altered extracellular matrix in OSCC with OSMF could be responsible for modified EMT, which is further proven by reduced intensity of α-SMA staining in OSCC with OSMF. This could be one of the factors which have been attributed to decrease LNM and better prognosis of the disease. Thus, the reactive changes in the tumor stroma may alter the biological aggressiveness of OSCC. Incorporation of these concepts into a prognostic system may help reflect the biologic diversity of OSCC and predict clinical outcomes. van der Waal I. Potentially malignant disorders of the oral and oropharyngeal mucosa; terminology, classification and present concepts of management. Oral Oncol 2009;45:317-23. Afroz N, Hasan SA, Naseem S. Oral submucous fibrosis a distressing disease with malignant potential. Indian J Community Med 2006;31:270-1. Hazarey VK, Erlewad DM, Mundhe KA, Ughade SN. Oral submucous fibrosis: Study of 1000 cases from central India. J Oral Pathol Med 2007;36:12-7. Desai RS, Mamatha GS, Khatri MJ, Shetty SJ. Immunohistochemical expression of CD34 for characterization and quantification of mucosal vasculature and its probable role in malignant transformation of atrophic epithelium in oral submucous fibrosis. Oral Oncol 2010;46:553-8. Ekanayaka RP, Tilakaratne WM. Oral submucous fibrosis: Review on mechanisms of pathogenesis and malignant transformation. J Carcinog Mutagen 2013;S5:002.
International Agency for Research on Cancer. Betel-Quid and Areca nut Chewing and Some Areca-nut-derived Nitrosamines. Vol. 85. Lyon: IARC; 2004. p. 123-9. Chaturvedi P, Vaishampayan SS, Nair S, Nair D, Agarwal JP, Kane SV, et al. Oral squamous cell carcinoma arising in background of oral submucous fibrosis: A clinicopathologically distinct disease. Head Neck 2013;35:1404-9. Sarode SC, Sarode GS. Better grade of tumor differentiation of oral squamous cell carcinoma arising in background of oral submucous fibrosis. Med Hypotheses 2013;81:540-3. George J, Narang RS, Rao NN. Stromal response in different histological grades of oral squamous cell carcinoma: A histochemical study. Indian J Dent Res 2012;23:842. Scanlon CS, Van Tubergen EA, Inglehart RC, D'Silva NJ. Biomarkers of epithelial-mesenchymal transition in squamous cell carcinoma. J Dent Res 2013;92:114-21. Albini A, Sporn MB. The tumour microenvironment as a target for chemoprevention. Nat Rev Cancer 2007;7:139-47. De Wever O, Mareel M. Role of tissue stroma in cancer cell invasion. J Pathol 2003;200:429-47. Tuxhorn JA, Ayala GE, Smith MJ, Smith VC, Dang TD, Rowley DR, et al. Reactive stroma in human prostate cancer: Induction of myofibroblast phenotype and extracellular matrix remodeling. Clin Cancer Res 2002;8:2912-23. Etemad-Moghadam S, Khalili M, Tirgary F, Alaeddini M. Evaluation of myofibroblasts in oral epithelial dysplasia and squamous cell carcinoma. J Oral Pathol Med 2009;38:639-43. Vered M, Allon I, Buchner A, Dayan D. Stromal myofibroblasts accompany modifications in the epithelial phenotype of tongue dysplastic and malignant lesions. Cancer Microenviron 2009;2:49-57. Pindborg JJ, Reichart PA, Smith CJ, Van Der Waal I, editors. Histological typing of cancer and precancer of the oral mucosa. In: World Health Organization International Histological Classification of Tumors. 2nd ed. Berlin, Heidelberg, New York: Springer-Verlag; 1997. p. 9-29. Tilakaratne WM, Klinikowski MF, Saku T, Peters TJ, Warnakuasuriya S. Oral submucous fibrosis: Review on etiology and pathogenesis. Oral Oncol 2006;42:561-8. Lalli A, Tilakaratne WM, Ariyawardana A, Fitchett C, Leigh IM, Hagi-Pavli E, et al. An altered keratinocyte phenotype in oral submucous fibrosis: Correlation of keratin K17 expression with disease severity. J Oral Pathol Med 2008;37:211-20. Angadi PV, Krishnapillai R. Evaluation of PTEN immunoexpression in oral submucous fibrosis: Role in pathogenesis and malignant transformation. Head Neck Pathol 2012;6:314-21. Philip T, Dinesh Kumar T, Rajkumar K, Raghavendhar KK, Priyadharsini N, Ramesh Kumar A. Immunohistochemical evaluation of myofibroblasts using alpha-smooth muscle actin in oral submucous fibrosis. SRM J Res Dent Sci 2014;5:243-7. Rao KB, Malathi N, Narashiman S, Rajan ST. Evaluation of myofibroblasts by expression of alpha smooth muscle actin: A marker in fibrosis, dysplasia and carcinoma. J Clin Diagn Res 2014;8:ZC14-7. Kellermann MG, Sobral LM, da Silva SD, Zecchin KG, Graner E, Lopes MA, et al. Mutual paracrine effects of oral squamous cell carcinoma cells and normal oral fibroblasts: Induction of fibroblast to myofibroblast transdifferentiation and modulation of tumor cell proliferation. Oral Oncol 2008;44:509-17.
de-Assis EM, Pimenta LG, Costa-e-Silva E, Souza PE, Horta MC. Stromal myofibroblasts in oral leukoplakia and oral squamous cell carcinoma. Med Oral Patol Oral Cir Bucal 2012;17:e733-8. White ES, Atrasz RG, Hu B, Phan SH, Stambolic V, Mak TW, et al. Negative regulation of myofibroblast differentiation by PTEN (Phosphatase and Tensin homolog deleted on chromosome 10). Am J Respir Crit Care Med 2006;173:112-21. Thannickal VJ, Lee DY, White ES, Cui Z, Larios JM, Chacon R, et al. Myofibroblast differentiation by TGF-b1 is dependent on cell adhesion and integrin signaling via focal adhesion kinase. J Biol Chem 2003;278:12384-9. Gu J, Tamura M, Yamada KM. Tumor suppressor PTEN inhibits integrin- and growth factor-mediated mitogen-activated protein (MAP) kinase signaling pathways. J Cell Biol 1998;143:1375-83. Tamura M, Gu J, Matsumoto K, Aota S, Parsons R, Yamada KM, et al. Inhibition of cell migration, spreading, and focal adhesions by tumor suppressor PTEN. Science 1998;280:1614-7. Kellermann MG, Sobral LM, da Silva SD, Zecchin KG, Graner E, Lopes MA, et al. Myofibroblasts in the stroma of oral squamous cell carcinoma are associated with poor prognosis. Histopathology 2007;51:849-53. Seifi S, Shafaei S, Shafigh E, Sahabi SM, Ghasemi H. Myofibroblast stromal presence and distribution in squamous epithelial carcinomas, oral dysplasia and hyperkeratosis. 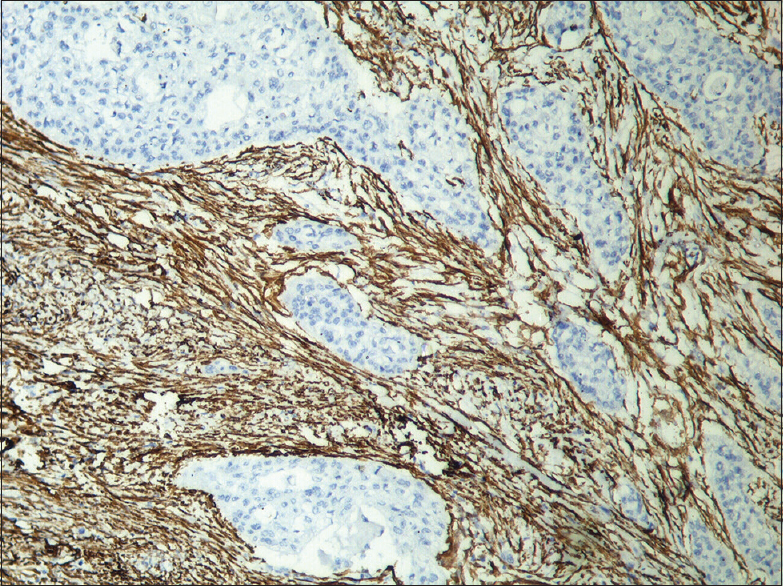 Asian Pac J Cancer Prev 2010;11:359-64. Chaudhary M, Gadbail AR, Vidhale G, Mankar Gadbail MP, Gondivkar SM, Gawande M, et al. Comparison of myofibroblasts expression in oral squamous cell carcinoma, verrucous carcinoma, high risk epithelial dysplasia, low risk epithelial dysplasia and normal oral mucosa. Head Neck Pathol 2012;6:305-13. Lewis MP, Lygoe KA, Nystrom ML, Anderson WP, Speight PM, Marshall JF, et al. Tumour-derived TGF-beta1 modulates myofibroblast differentiation and promotes HGF/SF-dependent invasion of squamous carcinoma cells. Br J Cancer 2004;90:822-32. Solorzano CC, Jones SC, Pettitjean M, O'Daniel TG, Auffenberg T, Woost PG, et al. Inhibition of transforming growth factor alpha stimulation of human squamous cell carcinoma of the head and neck with anti-TGF-alpha antibodies and tyrphostin. Ann Surg Oncol 1997;4:670-84. Jackson-Bernitsas DG, Ichikawa H, Takada Y, Myers JN, Lin XL, Darnay BG, et al. Evidence that TNF-TNFR1-TRADD-TRAF2-RIP-TAK1-IKK pathway mediates constitutive NF-kappaB activation and proliferation in human head and neck squamous cell carcinoma. Oncogene 2007;26:1385-97. Lynch CC, Matrisian LM. Matrix metalloproteinases in tumor-host cell communication. Differentiation 2002;70:561-73. Kawashiri S, Tanaka A, Noguchi N, Hase T, Nakaya H, Ohara T, et al. Significance of stromal desmoplasia and myofibroblast appearance at the invasive front in squamous cell carcinoma of the oral cavity. Head Neck 2009;31:1346-53. Massano J, Regateiro FS, Januário G, Ferreira A. Oral squamous cell carcinoma: Review of prognostic and predictive factors. Oral Surg Oral Med Oral Pathol Oral Radiol Endod 2006;102:67-76.